This unique and playful restaurant and bar are a perfect choice for doing business or just enjoying the company of friends. You will be surrounded by a warm an inviting atmosphere, charming and friendly staff and food and drink selections that reflect a wide variety of tastes. Conveniently located on the Heritage Quay boardwalk, The Coast offers you views overlooking the St. John’s Harbour where the evening sunsets are always a treat. Coconut Grove is located on the water’s edge at Dickenson Bay, surrounded by palms and lush tropical vegetation. This rustic, open-air restaurant and bar is “Every visitor’s dream of what a Caribbean restaurant should be”. They specialize in freshly caught seafood with a Caribbean flavour, known famously for their succulent Coconut Shrimp. Designed to take advantage of the lavishly landscaped gardens and palm tree framed views of the Caribbean Sea, the superbly positioned Palm Restaurant grants its guests a decidedly Caribbean alfresco dining experience. By day the restaurant oozes the relaxed feel of a Caribbean café. Head here after a morning swim to refuel for the afternoon ahead. If you like the idea of al fresco dining, then the terrace adjacent to the restaurant is ideal for that. As night falls a more refined feeling takes over and you are asked to dress accordingly in smart casual wear. Enjoy the star speckled sky as you enjoy a la carte dining at it’s best. 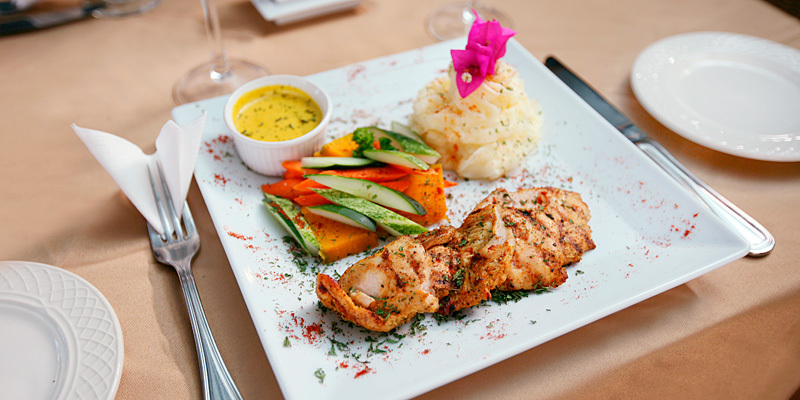 Bartleys Restaurant is one of the only restaurants in Antigua that offers comfortable, air-conditioned dining in an intimate setting. Situated within the main complex, the elegantly appointed Bartleys Restaurant offers the perfect opportunity for guests to share a romantic dinner, celebrate a special occasion or simply enjoy an evening of delectable entrees, fine wines, and great company. 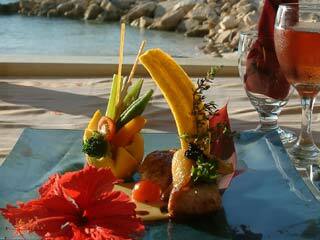 The Cove Restaurant at takes Caribbean dining with a French twist to an entirely new level. Uniquely situated on a cliff top, guests are greeted by flaming torches and a dramatic entrance leading into a candlelit hall. Once inside, guests will see that The Cove offers some of the most breathtaking views to be found anywhere in the Caribbean. Once you can draw your eyes away from the view, they will be equally as taken by the cuisine available.